A Christmas street party ensured Christmas arrived early on Carshalton High Street this weekend as local shops stayed open late offering locals festive food and drink and craft activities for children. Grazie Mille, the family-friendly italian Coffee Shop on the high street, served mulled wine and hosted a Santa Sleigh outside their doors.�Jude, the new jewellery and fashion accessories shop, offered local mums Christmas cake and drinks and provided Christmas craft activities and Christmas tree decorating for their children. The party also featured music from Carshalton Choral Society outside the Charles Cryer Theatre, live music from Crunch Studios and appearances from the Elves and The Shoemaker pantomime cast. "We really enjoyed joining in the Christmas fun and welcoming our customers and their families to our shop," said owners of Jude, Julie and Debbie, who made cakes and a festive punch for the party. "We love getting Christmas started on the High Street with this fantastic event," added Claudio, owner of Grazie Mille. "We are delighted that the kids loved the Santa Sleigh and their mums and dads enjoyed our mulled wine!" Local craft and gift store Calladoodles is also opened late and offered shoppers mulled wine and a special discount in their beautiful shop. "We have never been so busy or seen so many people in Carshalton," said owner Clare Callanan. "There was a wonderful atmosphere on the High Street." Be Beautiful, the popular beauty salon on the high street, also served bucks fizz and cup cakes and offered fantastic discounts on their products. 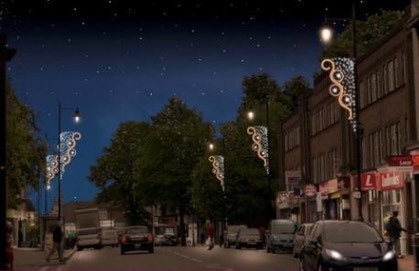 This year also marks the first year that Carshalton has ever had its own Christmas decorations after Carshalton Traders' Association managed to get a grant from Sutton Council. Campaigner Chris Blanks, of Elwyns Windows in Carshalton High Street, said: "We've campaigned for a number of years. We set up a traders' association two years ago and we've found it's allowed us to be taken more seriously. "We put in a bid for funding with the help of the council and we got the funding earlier this year. We've got that for the next three years." "I was fortunate enough to be given the job of choosing the decorations," added Chris. "I'm really pleased with the result." The lights were due to be switched on at 6pm but unfortunately suffered technical hitches so were switched on at the start of the party. "That's all part of the teething problems when you start something new," added Chris. "It's very Carshalton and the end result looks really good." Carshalton Frost Fair began the following day next to Carshalton Ponds. The event hosted stalls from many local groups and organisations featuring local food, drink, gifts, crafts and lots more. There was musical entertainment throughout the day and activities for children inside the Honeywood Museum. A Christmas Fair ran alongside at The Ecology Centre with a Winter Wonderland Trail through the grounds.